Margate's troubled Dreamland amusement park is borrowing a further £5m, increasing its loan from an offshore hedge fund to £15m. Arrowgrass initially agreed to a £600,000 loan in May 2016. Its investment was increased to £10m in January, with administrators Duff and Phelps saying the money would be used to get the park ready for sale. Dreamland's interim financial director Steven Mitchell said the company wanted to "create a sustainable business". The investment will be used for "new park rides and the restoration of existing ones", as well as "major upgrades" to indoor and outdoor event spaces. The company also plans to expand its footprint, which includes the acquisition of properties and land adjacent to the park. 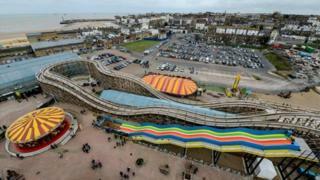 Chris Wells, leader of Thanet District Council, said it was "positive" to see investment going into Dreamland "to help secure its financial future". Sir Roger Gale, MP for North Thanet, said he was also pleased with the investment, adding: "I continue to have great confidence in Dreamlands' prospect as a major leisure complex." No-one from Arrowgrass, which is registered in the Cayman Islands, was available for comment.